Call it a Cosmic Scene Investigation: For the first time, scientists have identified a stellar victim of a giant black hole — an unlucky star whose death may ultimately provide more clues on the inner workings of the enigmatic gravitational monster that devoured it. Supermassive black holes are objects millions to billions times the sun's mass that lurk in the hearts of most galaxies. They lay quietly until victims, such as stars, wander close enough to get shredded apart by their extraordinarily powerful gravitational pull. Scientists first caught a black hole red-handed in a stellar murder last year. Now researchers have determined not only the culprit in a similar cosmic homicide but the casualty as well: a star rich in helium gas. Astronomers say supermassive black holes rip apart stars very rarely, maybe just once every 10,000 years per galaxy. To detect one such event, Gezari and her colleagues monitored hundreds of thousands of galaxies in ultraviolet light with the space-based Galaxy Evolution Explorer (GALEX) and in visible light with the Hawaii-based Pan-STARRS telescope. In June 2010, the researchers spotted a bright flare from the previously dormant black hole at the center of a galaxy approximately 2.7 billion light-years away. "When the star is ripped apart by the gravitational forces of the black hole, some part of the star's remains falls into the black hole while the rest is ejected at high speeds," Gezari said. "We are seeing the glow from the stellar gas falling into the black hole over time." The flare of light reached peak brightness a month after it was detected, then slowly faded over the next 12 months. By measuring the rise of the flare's brightness, the scientists calculated the rate at which the star's gas was getting sucked into the black hole. This in turn helped reveal at what point and time the black hole had begun disrupting the star, revealing how powerful its gravitational field was and thus its mass. The astronomers estimate the black hole's mass to be 3 million suns, comparable to our Milky Way's central black hole. "These spectacular events provide a glimpse into otherwise unobservable black holes, telling us about their masses," Gezari said. "We know that there are strong connections between black holes and the galaxies they reside in, and it turns out that somehow the mass of the black hole and the mass of a galaxy influence each other, so we want to better know what's going on there. Also, people want to understand the physics of black holes and how they affect the geometry of space-time around them. We need to know its mass to help pinpoint a lot of those details." These images from NASA's Galaxy Evolution Explorer GALEX) and the Pan-STARRS1 telescope show a galaxy that brightens suddenly, caused by a flare from its nucleus. 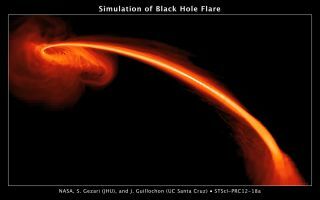 The flare is a signature of the galaxy’s central black hole shredding a star that wandered too close. Top Left: Taken in 2009, shows the galaxy before the flare t. Top Right: The galaxy has become 350 times brighter in UV light in June 2010. Bottom right image from Pan-STARRS1 in June-August 2010 shows the flare from the galaxy nucleus. In addition, Gezari and her colleagues analyzed the spectrum of the ejected gas — that is, the specific colors making up its light — using data from the Multiple Mirror Telescope Observatory on Mount Hopkins in Arizona. Each element has a unique spectral fingerprint, and the spectrum of the gas revealed it was mostly helium. "It is like we are gathering evidence from a crime scene," Gezari explained. The fact there was mostly helium and very little hydrogen in the gas suggests "the slaughtered star had to have been the helium-rich core of a stripped star," Gezari said. "This likely happened when the star went through the red giant phase, where it expanded to 100 times its original radius," Gezari said. "When it puffed up like that, it became vulnerable to the gravitational tidal forces of the black hole, and it would have been very easy to strip off the tenuous hydrogen envelope. "However, the star then had to approach much closer, 100 times closer in, before it was completely disrupted by the black hole. We think it approached all the way in to one-third of an astronomical unit, similar to the orbit of Mercury [about one-third the distance between the Earth and sun]. We then saw the helium gas streaming into the black hole." The scientists detailed their findings online today (May 2) in the journal Nature. "This is the first time where we have so many pieces of evidence, and now we can put them all together to weigh the perpetrator — the black hole — and determine the identity of the unlucky star that fell victim to it," Gezari said. "These observations also give us clues to what evidence to look for in the future to find this type of event." The upcoming Large Synoptic Survey Telescope, capable of scanning half the sky every night, should detect far more of this carnage. "We can measure at what rate stars are being disrupted by black holes as a function of the type of galaxy, measure the masses of the black holes, see what types of stars orbit black holes in the centers of galaxies, and try and better understand the evolution of galaxies over time," Gezari said. "There's a lot more to be done."